Published on November 18, 2009 in books and c++. 0 Comments Tags: books, c++. After several years of working with Java, C#, SQL and web technologies in general, there’s some time to use the other languages. Among others I’ll be writing some C++ code from time to time now. I used C (and alittle bit of C++) when I was a student but that were all small projects and it was years ago. Now, it’s obvious I need to catch up with C/C++. 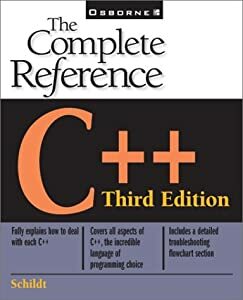 I happened to get C++: The Complete Reference by Herbert Schildt. The word reference implies there’s probably no point in reading this book from title-page to colophon; there’s a lot of reference data like the standard function library. However, what I really liked about this book is it gives a quick introduction to most important aspects of C/C++ (e.g. pointers, classes, references, overloading, templates), of course with obvious and numerous code examples. Recommended. It’s worth keeping this book nearby while working with C++.